This PDF 1.5 document has been generated by Adobe InDesign CC 13.0 (Windows) / Adobe PDF Library 15.0, and has been sent on pdf-archive.com on 09/04/2018 at 17:59, from IP address 78.56.x.x. The current document download page has been viewed 123 times. File size: 2.5 MB (13 pages). 1. 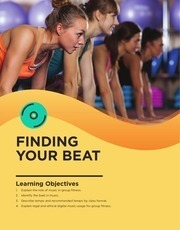 Explain the role of music in group fitness. 2. Identify the beat in music. 3. Describe tempo and recommended tempo by class format. 4. Explain legal and ethical digital music usage for group fitness. Music is used in a variety of ways to enhance and elevate the group fitness experience. positive associations between exercise and accomplishment. ordinary to extraordinary with a simple tap of the play button. humans to music for thousands of years. dance promote positive social behaviors, they helped human culture flourish. in complexity, the human brain adapted to process it. entrainment occurs when one moves to the beat while predicting upcoming beats. Did you know that different parts of music affect us in different ways? Lower and raise heart rate. Distract from the difficulty of exercise. Help exercisers feel more positive and foster more interest in exercise. period, and then heart rate and blood lactate levels during the recovery period. heart rate recovery throughout and reduced blood lactate levels. asynchronous music, synchronous music, and fast-tempo asynchronous music. and treatment of common running-related injuries. their audio devices more frequently than did their non-RAS music counterparts. foreground music, fun, cueing, pacing, mood setting, and choreography design. grouped together to form the structure of entire songs. downbeat and didn’t start a movement on count 1.
consistent, pleasing, and easy to follow for participants and instructors alike. The end of a phrase is a good time to prepare a class for an upcoming change. complete for the entire class. Tempo is the speed or pace of the music, and is noted by “beats per minute” (BPM). double-time to accommodate various fitness movements and goals. Basic time is when one moves to the beat with one movement on every single beat. in formats like HIIT, cycling, aqua, and more. counts 4, 3, 2, and 1. This file has been shared by a user of PDF Archive. Document ID: 00754694.